True Gentleman is a collaboration with Meghan Mullens. In a neutral color palette with elements geared toward any guy it makes the perfect kit to scrap those men and boys in your life! and over 70 elements. 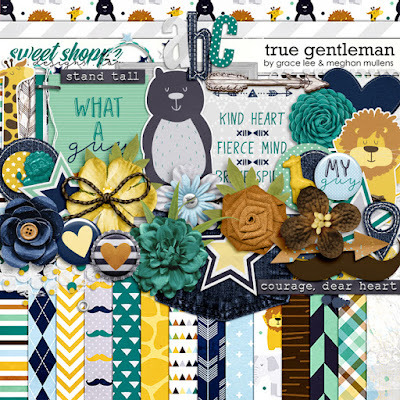 The elements included are: arrows, giraffe, elephant, bear, lion, ribbons, bow, frames, foliage, flowers, bottle caps, flair, journal cards, wordart, heart, map, marker, denim bits, stars and much more! !